Brazilian official request private tour of Samaria, says the tour changed his view of the Jewish communities. Brazilian Tax Authority Head Foch Simao Junior recently made a special trip to Samaria, and asked his hosts to take him on a tour. Simao's visit was unofficial and personal. Until now Brazilian senior officials have viewed the Jewish presence in Samaria as illegal and ignored its existence. In his words, the facts on the ground were totally different from the reports received around the world. Touring the town of Kedumim, Simao learned about Israel's security situation and the recently attempted terror attacks. He also saw other parts of Samaria, making a trip to Mount Gerizim, where he was able to view Joseph's tomb from afar. 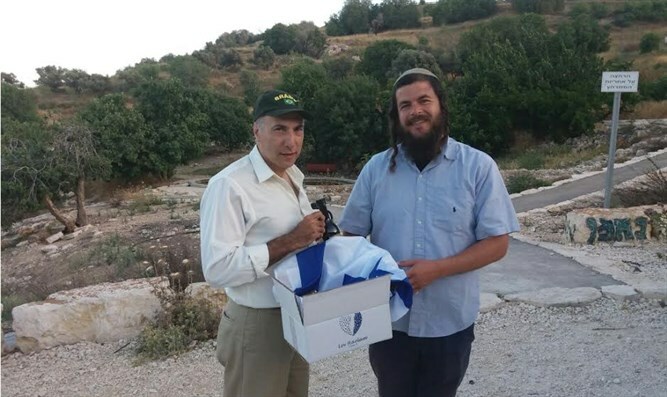 At the nearby Amasa Spring, Simao met with Lev Haolam Founder attorney Nati Rom. Rom explained the struggles of small businesses and manufacturers in Judea and Samaria, and their fight against the boycott and BDS movements. Rom also told Simao about Lev Haolam’s project, in which packages of products from Judea and Samaria are sent to consumers around the world. Rom gifted Simao with one such package that included olive oil from Achiya, chocolate from Har Hevron, and other products from Judea and Samaria. Simao thanked Rom and was very moved upon receiving the gifts. "The biggest enemy of the Jewish communities in Judea and Samaria is ignorance and a lack of understanding of the situation on the ground," Rom explained. "The demonization of Israel and the Jewish pioneers in the world is not understandable." "There is a clear disconnect between what happens on the ground and the way things are reported in foreign media. We view our role as bridging this gap by presenting the truth and showing the reality to the world. "We see very clearly how our presentations and meetings with people all over the world, including through our sending of packages and brochures to consumers, has changed peoples’ perceptions. This is the answer to BDS and this is the answer to the boycott. "This outreach is the only way to change international opinion and bring people to support Israel and the Jewish pioneers of Judea and Samaria. We will continue with this project to tell the truth about the Jewish people’s long history and deep connection to this holy land."